Nowadays, Magento 2 is the new generation of Ecommerce, with all enthusiastic and effort along with long-year experience in providing open source solutions, all Magento 2 extensions are the pride of Netbase team. We always try our best to perfect your eCommerce websites by releasing the premium Magento 2 extensions with outstanding features. We believe that they can satisfy even the most demanding customers. According to the latest research, among 30 popular ecommerce platforms available on the market, Magento has made up 30% of the total market share. This desirable figure might be the clearest evidence for the popular floating level as well as reputation of Magento all over the world. Before Magento 2.0 version is released, more than 240,000 shops in the market were using Magento 1.x. However, time has changed and Magento 2 has been developed to satisfy all complicated needs of the new era of commerce in terms of speed, scalability and extensibility. That we build a list of Magento 2 extensions can be define as the most feasible choice to set up the stage for beneficial businesses in near future through web technology. 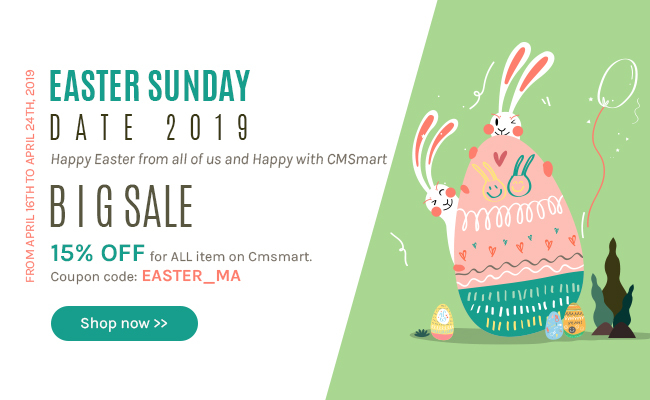 Magento 2 extensions from Cmsmart marketplace seem to be the perfect decision offering everything that any business would require thanks to its full-fledged as well as highly innovative architecture. On Cmsmart, the principle of Magento 2 extensions' architecture are as follows. Well examined and better Magento 2 extensions: before releasing any extensions, we always pay attention to examine them, we want to bring users the perfect and optimize benefits of them. Responsive design: Customer can view it on all devices as desktop, laptop, tablet or smart phones without any problem on presentation. Easy to install and use: we develop those Magento 2 extensions for any people can install it as description in user guide because we all know that not all users are master of information technology. So, with the simple step to install and configure, you can be easy to set up our extensions. 6 months download and upgrade: after purchasing, you can download, upgrade and require support within 6 months ( 3 months with some special products). 7 days refund: If you are not satisfy with our product, open a ticket to request a refund. If refund is accepted, the value of refund will be CHANGED INTO REWARD POINTS for buyers. We will NOT ISSUE REFUND BY MONEY.